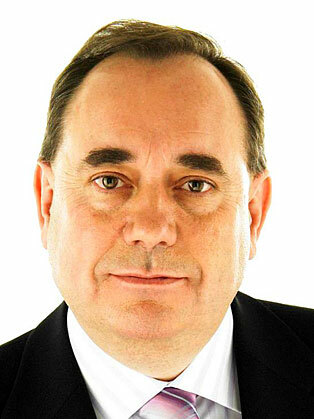 Alex Salmond was born in Linlithgow in 1954. He attended Linlithgow Academy before studying at St Andrew's University, where he graduated with a joint honours MA in Economics and History. In 1978 he joined the Government Economic Service as an Assistant Economist in the Department of Agriculture and Fisheries for Scotland. In 1980 he joined the Royal Bank of Scotland where he worked for seven years: first as an Assistant Economist before being appointed Oil Economist in 1982, and from 1984 combining that role with duties as a bank economist. He has also been a visiting professor of economics at Strathclyde University. He was first elected as MP for Banff & Buchan in 1987 and was elected as National Convener for the Scottish National Party in 1990. He served as leader of the opposition in the Scottish Parliament when he was elected MSP for Banff & Buchan constituency in 1999. He stood down as SNP National Convener in 2000 and left the Scottish Parliament in 2001. He was re-elected as Leader of the SNP in 2004 and elected as MSP for the Gordon constituency in May 2007. He made political history after becoming the first nationalist to be elected First Minister of Scotland on 16 May 2007. He stepped down in November 2014.